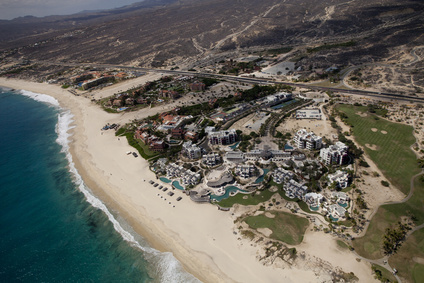 Monarch Air Group provides private air charter in Los Cabos, Mexico. Our clients benefit from top-notch service, unrelenting dedication to safety, wide selection of aircraft, and years of experience in chartering private jets. To obtain a free quote, please use our online quoting tool provided below, or call toll free 1-877-281-3051. Monarch Air Group provides private jet charter flights in and out of Los Cabos, Mexico. Los Cabos is a municipality situated at the southern tip of Mexico’s Baja California Peninsula, in the state of Baja California Sur. The municipality had an area of 1,332.64 sq. mi and a population of 238,487 people. Los Cabos has something to offer for everyone from watching whales, world-class golf, fishing, scuba diving, snorkeling and kayaking, biking, luxury spas and resorts. The most popular tourist attractions are Lover’s Beach and the Arch, Arts and Crafts Center, Blue Coast Beach, San Jose Estuary, Sport fishing, The Sand Dunes and the Old Lighthouse, Santa Maria Beach. 1. PCO, Punta Colorada, Punta Colorada, Mexico. 2. SJD, Los Cabos, San Jose Del Cabo, Mexico. 1. Pueblo Bonito Sunset Beach Cabo San Lucas, Predio Paraiso Escondido S/N, Centro. 2. Casa Dorada Resort & Spa, Avenida Pescador S/N, El Medano Ejidal, Cabo. 3. Pueblo Bonito Rose Resort & Spa, Playa El Medano S/N, Cabo. 4. ME Cabo, Pescador S/N, Zona Hotelera, Cabo San Lucas. 5. Hotel Riu Palace Cabos San Lucas, Camino Viejo a San Jose , Cabo. 6. Comfort Inn Los Cabos, Leona Vicario, Cabo. 7. Pueblo Bonito Pacifica Holistic Retreat and Spa, Cabo Pacifico S/N, Paraiso Escondido, Cabo. 8. Hotel Riu Santa Fe, Camino Viejo a San Jose, El Medano Ejidal, Cabo San Lucas B.C.S..
9. Pueblo Bonito Sunset Beach Cabo San Lucas, Predio Paraiso Escondido S/N, Centro. 10. Pueblo Bonito Sunset Beach Cabo San Lucas, Predio Paraiso Escondido S/N, Centro.